Dark Sound’s price is dictated by the latest closed crude oil Brent price (LCO) – one copy for the price of 1 barrel (≈ 159 liters), while the current exchange rate (from USD to EUR) is taken into account as well. Both values are automatically fetched once each working day – shortly after midnight CET. Please note that price updates also apply to the pricing of any copies within your cart. 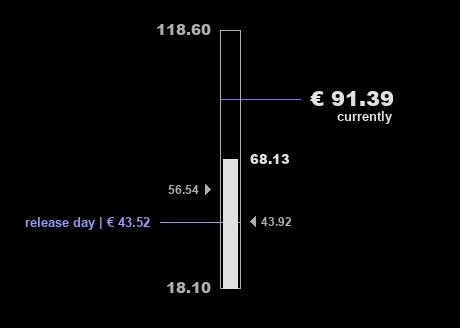 Depicted above is the price range in which Dark Sound was offered thus far, and in addition the range in which copies actually sold (filled bar). The two triangle markers show the respective average values.